This was a very useful description. 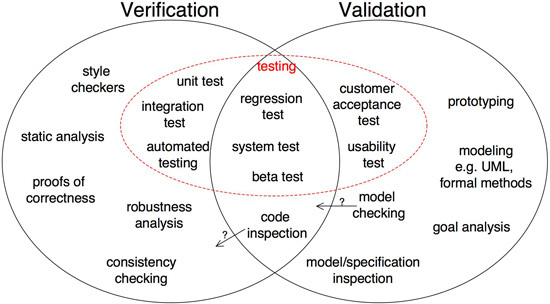 The diagram was especially useful in analyzing verification vs validation testing. very nice and really helpful article… it gives a clear idea of verification and validation. 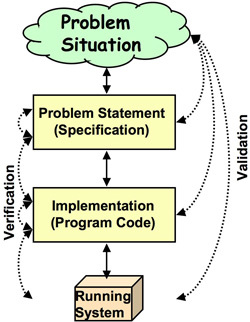 useful article on verification and validation. thanks! Thanks for this article. This will be helpful in my final year project. need it for the list of reference for my final year project. thank you. Useful post. It helped alot to understand the differences between Validation and verification. Thanks again for this awesome article. Thanks a lot for very clear and informative article! The question I have, is: why is there such an emphasis on Validation at all? As you said, validation is a very subjective process. What one person thinks might be a “valid” feature may be considered useless to another person. The perception of “user needs” can vary widely. Companies often release new types of products with a hope that they will meet consumers’ needs, but no one can predict whether these products will be successful or not. Whether a product meets user’s needs seems like a criteria that should be considered by marketing departments, but not enforced through a design oriented process. To give a concrete example…. when the personal computer was created there were many ‘experts’ who said that it was foolish to have a computer in people’s homes. From a validation point of view, you would conclude that this product does not meet the end-user’s needs. However a number of innovative companies such as IBM and Apple released PCs anyway, and the rest is history. A strict V&V assessment might have killed the concept of personal computers. So why is Validation considered so important in the design process? Mohan: Good question. The short answer is that it depends on what kind of software you’re building. For a lot of consumer-oriented software, as you suggest, validation can be left to the marketplace. Or for a higher success rate, work closely with (potential) users, using an iterative approach where you build and deliver in small increments, and get feedback on what users like and don’t like about it. But if you’re building safety-critical software, validation is crucial. It turns out the root cause of most software-related accidents is failure to validate: the software did the wrong thing in a situation that the software developers should have anticipated. In other words, they didn’t validate their understanding of the problem domain.